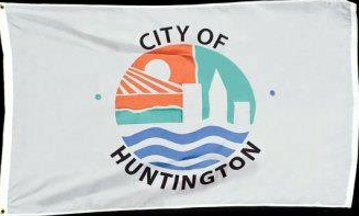 Huntington’s flag has a white field and proportions of 4 by 7 units. HUNTINGTON runs across the field horizontally for about 5.5 units, 1.5 units below the top edge. The initial letter “H” is composed of four interlocking rectangles outlined in yellow, twice the size of the remaining letters, which are black. These letters appear to be on a white strip overlaid on a blue circular gear 2 units in diameter, with 7 teeth visible above and 7 below the letters. Above the “TO” in HUNTINGTON is 1871, in black, about half the height of the other letters. Immediately below the city’s name, on the hoist side of the gear, is WEST, and on the fly side, VIRGINIA, in black letters the same height as the date. Centered below the lower edge of the gear is another, smaller blue gear, about .75 units in diameter, with 9 teeth, which appears to intermesh with the larger gear above. The smaller gear is encircled with a narrow white space from which extends, on either side, a shape resembling wings made up of red, white, and blue horizontal stripes, top to bottom. From tip to tip across the entire figure, the red stripe extends about 3 units; the white stripe, about 2.5 units, and the blue stripe, 2.25 units. Below that figure, about .5 units from the bottom edge of the flag, is GEARED FOR PROGRESS, centered in black letters the same height as the name of the state above. The gears and motto, “Geared for Progress”, are meant to show that Huntington is a thriving city commercially. The city was incorporated in 1871. Gordon P. Chain, a retired draftsman from the city. The date of introduction suggests that the flag may have been designed during the United States bicentennial commemoration. Source is unknown (likely a city Facebook page), but quite different from the flag featured in American City Flags and shown above.